What do you see when you look at the cross? I think many have trained themselves to skip looking at the cross in any serious way, and move straight into the resurrection. It’s natural for churchgoers around here to do this. First of all, because we only go to church on Sundays and the Sundays of Holy Week are very triumphant—from Palm Sunday straight to Easter Sunday. Second, because we Protestants have embraced an empty cross (without Jesus on it) at the expense of losing sight of the flesh and blood suffering which happened. We’ve been taught to see only the resurrection. It’s perfectly fine that our empty cross is also a year ‘round declaration of resurrection. After all, resurrection is our hope and salvation. But every once in a while, on a regular basis actually, we must see Jesus on the cross and understand what his torture and death were all about. What we have lost through seeing an empty cross is our calling. We see the cross and say, “whew, I’m glad Jesus did that so I don’t have to.” We see the cross as a means to an end, as a past event, something Jesus did (which we don’t participate in) before his resurrection (which we do participate in). Rather, we should see ourselves up on that cross too. We should see the cross as our calling, not just as something Jesus did so we wouldn’t have to. We are called to empty ourselves, reduce ourselves, for the sake of the world. We are called to take up a cross and follow Jesus, even unto death. We are called to share with Jesus, and thus with all sufferers, in suffering. We called to live a life worthy of the gospel, a life that naturally leads to suffering and then to resurrection, a life laid down, a life such as that which was demonstrated on Maundy Thursday. 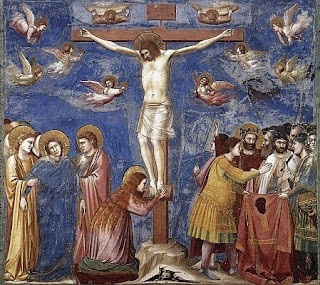 The Celebration of Holy Week—especially Maundy Thursday, Good Friday, and Easter Sunday—gives us the opportunity to see the life lived toward Salvation (Maundy Thursday), the suffering and death from which true righteousness naturally results (Good Friday), and the New Creation (Easter Sunday) which springs up from the soil of sacrifice. Good Friday, itself, gives us opportunity to see Christ, the Messiah, hanging on a cross. May we see this and realize that others have suffered as well and we are called to community with suffering people—we are called to sacrifice. Today, may you share in Jesus’ suffering.